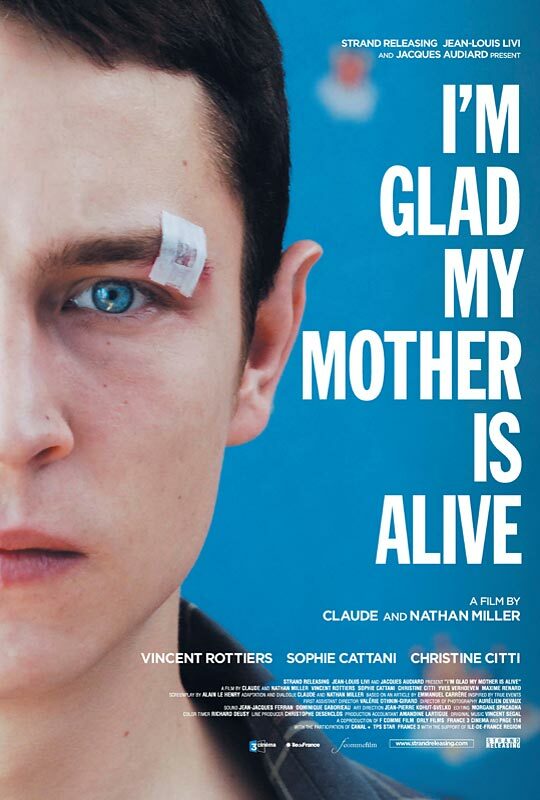 Verrier's Freudian-derived thesis is vividly illustrated in I'M GLAD MY MOTHER IS ALIVE (Je suis heureaux que ma mère soit vivante), a 2009 film written and directed by Claude Miller, a veteran French director, and his cameraman son, Nathan. Based on a true story, the film tells the story of Thomas Jouvet, a teenager who rebels against his well-meaning adoptive parents (Yves Verhoeven and Christine Citti) and searches for his birth mother. I'M GLAD MY MOTHER IS ALIVE toggles between the present day, as Thomas gets in trouble for fighting in school, and his harrowing early childhood, when he and his younger half-brother, Patrick, were left in the casually negligent care of their mother, Julie (Sophie Cattani). So careless a mother is Julie that she leaves 4-year-old Thomas in charge of his infant brother while she takes off for days with a friend. Not surprisingly, the authorities remove Thomas and Patrick from Julie's chaotic home, and she is compelled to give them up for adoption; Annie and Yves Jouvet adopt both boys, changing Patrick's name to François. Despite the Jouvets' loving care, the primal wound remains unhealed in the teenage Thomas ( Maxine Renard), first seen on a beach holiday with his parents. Angry and resentful of the Jouvets (“You're not my real parents!”), he wrangles his birth mother's address from a reluctant registry official. He knocks on the door to Julie's suburban flat but runs away when she appears, newly married and happily pregnant. At 20, Thomas (now played by Vincent Rottiers) is seemingly better adjusted and working as an auto mechanic. 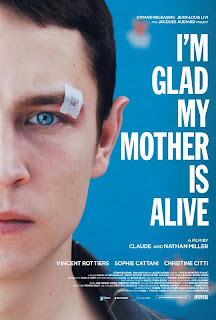 His relationship with his mother is improved; his brother, François (Olivier Guéritée), is a sanguine teenager with no interest in hearing about his birth mother. Thomas again visits his mother, now divorced from a wealthy man and raising her young son. He approaches her rather like a suitor, with chocolates and flowers in hand, a hallmark of the unusual, strangely sexualized relationship that develops between them (Julie is only 17 years older than her son). The play of emotions on Cattani's face as Julie searches for her feelings for her revenant son. – she doesn't even ask about Patrick/François, as Thomas chidingly reminds her -- is wonderfully subtle, and Rottiers' resentment of his mother's neglect and loving indulgence of her new son, feel quite real. Thomas, confused in an Oedipal way, tells his adoptive mother he has a “girlfriend,” and Julie uses Thomas as a convenient babysitter and a confidante, inflaming his primal anger by blithely telling him about men she's dating. His mother's sexuality is front and center in the mother-son relationship, replicating the fateful pattern of years ago. The narrative's stark, almost documentary quality, makes the paroxysm of violence at the film's climax seem especially especially shocking, yet as inevitable as Greek tragedy. With realistic writing and persuasive acting, the film elicits sympathy for all of the characters – the grievously wounded Thomas, the devoted but helpless adoptive mother, the father descending into dementia, and Julie, who could never be the mother Thomas needed. 3 1/2 out of 4 stars. Every so often it's good to see a film "cold". I'm glad I read nothing about the film except the Cinematheque blurb - "fraught Freudian relationship gets weirder from there" and the NYT "Anything but the cliched fantasy of a blissful mother-child reunion" are a bit more amorphous/ vague than "paroxysm of violence . . . as inevitable as Greek tragedy". Ms. Zoslov writes a good review, but I'm glad I read it *after* seeing the film. Pamela - you could've put a "there be spoilers here" at some point. I don't think I've "jumped" internally/ externally this much since I first saw Verhoeven's "The Fourth Man. Sorry, derhofnarr. I don't think "paroxysm of violence" is necessarily a giveaway of what happens. Thank you for reading!